In 2002, Warner Bros and Milos Forman created an extended “Director’s Cut” of Amadeus, releasing it in theaters and later on DVD. This extended cut added 20 minutes of footage to the film (mostly in the first half) which expanded on just how far Antonio Salieri would go to ruin Mozart. Reactions to the extended cut were mixed. Critics have called the additions extraneous, ruining the original editing and pacing of the film. Mozart’s two visits to the home of Schlumberg (the guy with the dogs) are the best example of that as they add nothing to the story and halt the narrative. While the theatrical cut showed Salieri sabotaging Mozart at every step, the director’s cut takes it to a needlessly vicious and mean-spirited extreme. For Blu-ray in 2009, Warner Bros. released the director’s cut only, largely because that HD master was available and that there was no HD master of the theatrical cut in existence. 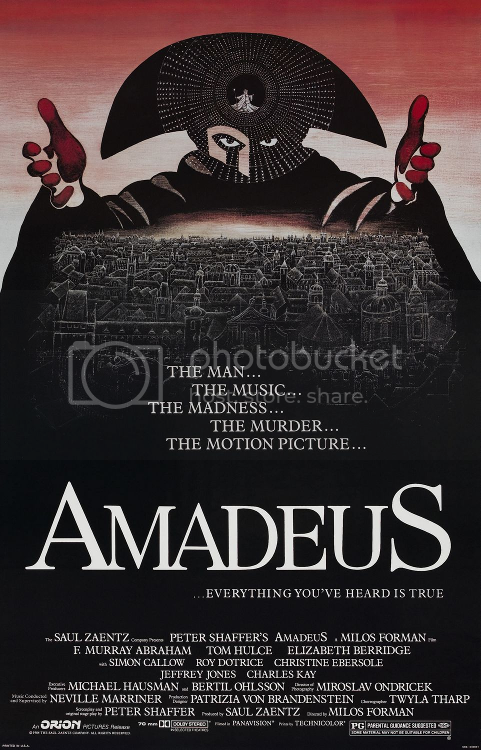 With WB and Forman apparently disinterested in revisiting Amadeus, we may never see the original version released again. The last American release of the original version was a flipper disc DVD in 1997. To reconstruct the original 160 minute theatrical cut in high definition, editing out the added scenes, while using upscaled and color-adjusted DVD footage to restore brief scenes/shots not included in the director’s cut. Several extended scenes were edited to their original length, most notably Salieri telling Constanze about “the price”. One minute thirteen seconds of upscaled DVD footage (plus ending credits) were used to replace shots either absent or shortened in the director’s cut. Overlays from the DVD were used to obscure the “Director’s Cut” title, as well as a castmember added to the credits in the director’s cut. One alternate shot from the director’s cut was retained due to poor quality on the DVD - Mozart writing Marriage of Figaro while his father and wife argue. *Laserdisc PCM mix not currently available. If it becomes available, I will sync the audio and release the track separately for viewers to mux themselves. The last release of the original version was a flipper disc DVD in 1997. Actually, there was a region 2 release in 2000 on a dual layer disc. The original PG rated version would also be more family-friendly than the R rated director's cut. The original cut of this movie had a better balance of comedy and drama, and introduced a lot of people young and old to the music of Mozart, it's a shame the only way to watch it in anything close to state-of-the-art is in its overlong, more adult version. I would suggest, if possible, including the Pioneer Special Edition laserdisc's PCM Dolby Surround track and commentary? I don't know if anybody has already ripped these, but the LD's PCM track is really nice, especially for the music. That LD also had a Dolby AC-3 track that I assume is the same as what appeared on the DVD. If someone can send that to me, I can incorporate. I spliced in some audio from the 1997 5.1 mix because I noticed some changes in the DC mix. Amadeus is one of my 10 favourite films! It's really shame that they haven' t released the Oscar winning theatrical cut! Looking forward to this too! Thank you very much! Back in the good old days, I'd put something like this on Megaupload. What's a good cheap service where I can upload 25GB? stretch009, I dig your signature. I too made the same keyed car analogy a while back to those who think a few seconds of change here and there was no big deal. Are you a member at MySpleen? Would you make a torrent for there? Do you mean mega.co.nz? That is definitely a good one. Harmy uses uloz.to and multiupload which are good also. You accompliced a quite difficult task... great job, congratulations! Hope you will release some other interesting titles soon! I am not as upset as some people by the "Director-Decided-to-Put-Back-Scenes-He-Originally-Chose-To-Cut Cut", but I do agree that the theatrical is a tighter, stronger movie, and that the DC's extended second act constantly threatens to stop the film dead in its tracks. I bought the flipper in a drugstore discount rack just so I could have the TC, so bravo for taking the effort to recreate it in HD. Any possibility of including an isolated score? Why did you not include the unchanged 1997 track? Apart from the Orion logo it should match the theatrical cut, shouldn't it? I used primarily the 2002 mix because it is lossless. I borrowed sections from the 1997 mix to clean up the edits. I noted some different ADR in the extended cut, so I replaced it back with the original. I'm aware that not everyone has the capability of playing FLAC 5.1, so I included a lossy DD 5.1 version of the same mix for added compatibility. I'm only using Adobe Premiere, which does not have native Dolby/DTS output capability. If I could have made clean edits to the Dolby TrueHD track without uncompressing it, I would have. My workaround has been to output each channel as a mono WAV file, and then compile the 5.1 mix in FLAC. At 16bit, I cannot create a 5.1 WAV that's larger than 4GB. Now that I think about it, I should have included the 1997 mix as a separate track as a courtesy. Thank you. It's my second. I created an extended cut of Superman IV many years ago. It's fun working on a movie I actually like for a change. I may be getting that soon actually. I wonder if the analog isolated track on the Pioneer CLV disc (and ONLY the CLV disc, not the CAV box set) would sound better than the digital one on the first DVD? Does the fact that it's not digital negate any possibility of it being better than the lossy Dolby track on the DVD? I assume it would be PCM, yes? It never hurts to include a lossless track of the original mix. I'll listen to that and the 1997 mix to see if there are any differences besides the surround. Though I am uploading it now, I will be making a version 2 which will include the original 1997 mix, and hopefully I can include the LD audio as well. I'm working on syncing the video to the 1997 mix now. I created version 1 using the director's cut mix with some 1997 inserts. Once I do that, theoretically the LD mix should drop right in. Supplementary audio on laserdiscs was recorded on the stereo FM analog tracks, which, while not PCM, might be a better sounding source than a lossy Dolby Digital track. The PSE (which was in CLV as well) couldn't fit an isolated track because it had the commentary on one analog channel and the Dolby AC-3 audio on the other. Right. The movie-only 1996 Pioneer release had the PCM and AC-3, but an isolated score instead of the commentary. I just assumed the box set was in CAV. Thanks for clearing that up. I think it would be worth it to track down, in the (apparently quite likely?) case that it sounds better than the DVD. The score is amazing (and I have always been miffed that the official soundtracks all leave out my absolute favorite part, the opening bars from Don Giovanni that start the film and return as the leitmotif for Mozart's father and the disguised Salieri). I'd love to include those tracks if someone could provide. I'm about an hour into Version 2. In the first go, I trimmed out the added and extended scenes and reinserted the missing scenes, while using the 2002 mix. This time I'm going backwards, cutting the movie to sync with the DVD mix. I'm finding several instances where shots are 3-5 frames longer than they were originally, requiring several more edits than Version 1.